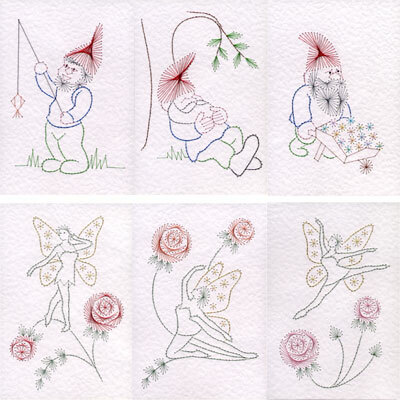 Three garden gnome patterns and three fairy patterns have been added to the Stitching Cards collection. There is a gnome fishing, a gnome sleeping and a gnome with wheelbarrow. These make amusing cards for garden enthusiasts and would be suitable for birthdays, retirements and other messages. A fairy standing, a fairy kneeling and a fairy leaping are combined with Art Nouveau inspired roses. They make beautiful cards for many occasions, especially for young girls. The patterns are available individually and in a value pack of all six designs. The pattern size is 152 mm x 104 mm (6 x 4½ inches). Wow, I can see I need to bye these!! I always have trouble finding decorations for St. Patricks Day and these will be fun to make and put around the house. Lovely! !